They also offer croissants, coffee, sandwiches, baked salmon. and a plethora of Shabbat dishes…. Quite a number of locals were there to pick up their challahs and Shabbos dishes, considering I had some of my grandkids from Providence over for Shabbos, I ended up getting one seeded and two without seeds. They looked good and judging by the way some of their regular customers praised them I have no doubt they will be. 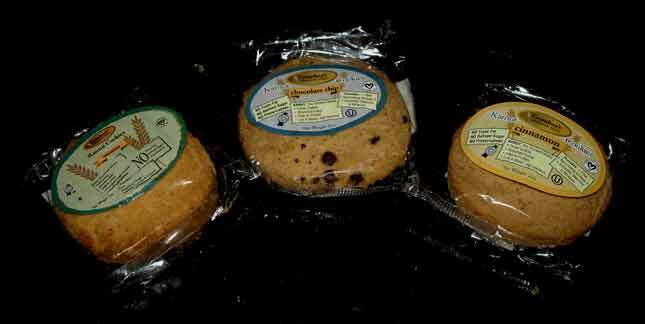 All their baked products are amazingly parve, but you’d never suspect it from the taste! As I toured Lilly’s Home Style Bake Shop, the sweet aromas wafting through the air, I was transported back to my mother’s kitchen, where the promise of sweet delicious treats were imminent as she prepared Shabbos or Yom Tov cakes and cookies. This past Tuesday morning, I walked the plant with Ethan Lieberman who together with CEO Irving Guttman, started the company in 2004 and kept on expanding the premises as new machinery was needed to streamline production of their growing product line. From jumbo to regular sized bagels, to assorted breads and challah types of various shapes and sizes, to mouth watering cakes and danishes, to cookies and biscottis, all beckoned before my gluttonous Hansel and Gretel eyes as the various doughs were being made, shaped and baked. Lilly’s (named after Ethan‘s – Avrumi‘s – mother) ships nationally under their own name and under various private labels – including well known supermarket chains and warehouse type wholesalers. The whole operation is supervised by Silliker, a third party approver which specializes in certifying the cleanliness and strict adherence to codes governing this type of operations. Kashrus is under OU supervision. Enjoy, gentle reader, enjoy! 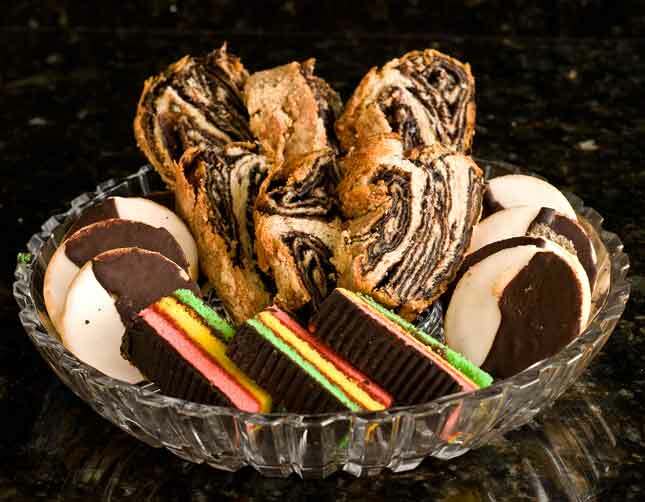 As for me, I’ll just grab another piece of that decadent babka oozing with chocolate… Get your own, kid!!! Preheat the oven to 325 F. Grease a 4″x8″ loaf pan. Line the base and and sides with nonstick baking parchment paper to come to 1″ above the sides. Grease again and dust with flour. Sift the flour, salt and ginger into a bowl. Put the dates into a large bowl with bicarbonate of soda. Pour over the boiling water and leave to stand for 5 minutes. Stir the egg and butter [or margarine if you prefer it pareve] and flour mixture into the date mixture and beat with a wooden spoon until well blended. Stir in the nuts. Pour the mixture into the loaf pan, smoothing the top. Tap the pan gently on a surface to expel any air bubbles. Bake in the center of the oven for 1 hour or until set and well colored and the bread begins to pull away from the sides of the pan; a knife inserted in the center should come out clean. Transfer to a wire rack to cool for 5 minutes , then leave to cool completely Using the paper as a guide, carefully remove the bread from the pan. If not serving the same day keep in the paper to prevent drying out.To serve, remove the paper from the base and sides, slice thinly. The bread came out very aromatic, it tasted subtly sweet, we had it with some cholov Yisroel Mascarpone cheese made at Pomegranate Supermarket‘s kitchen and recommended by their resident cheese expert, none other than our good friend Elizabeth Bland. We washed it down with a Herzog Selection Chateneuf 2009, a white semi dry with a fresh, fruity bouquet. 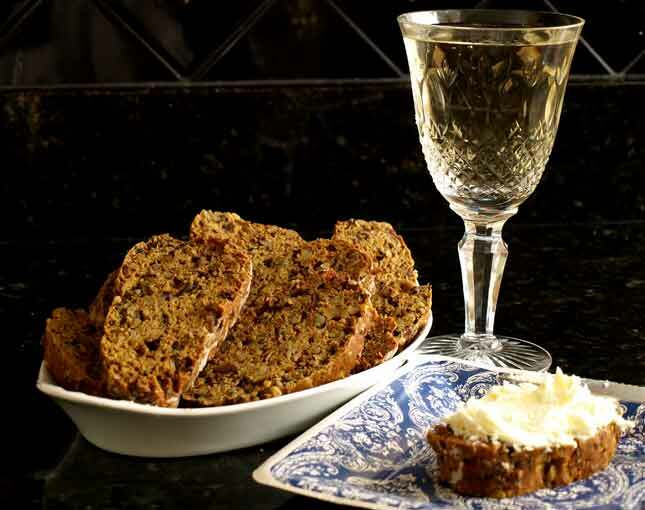 The bread was delicious, the Mascarpone just right, and the wine proved a perfect pairing! Categories: Aegilops tauschii, baking bread, baking kosher, baking recipe, bread, dinkel, dinkelbrot, einkorn, emmer, Encyclopedia of Jewish Foods, farro grande, Gill Marks, Green Kern Soup, kosher, kosher baked goods, kosher baking, kosher baking recipe, kusmin, spelt, spelt bread, spelta, spelze, The Settlement Cook Book and triticum spelta L.
Recently, I’ve been experimenting with various grains in place of common wheat in breads. I’ve made rye bread many times over the years, but always with some wheat flour in the dough. A couple of weeks ago, I baked a 100% rye bread, which turned out rather flat and very dense and with a nutty, fruity flavor. It was perfect with lox. I have some einkorn flour in the refrigerator awaiting use in the near future. Meanwhile, I’ve been enjoying spelt bread the past few weeks. Spelt (triticum spelta L.) — dinkel in German and Yiddish; farro grande in Italian; kusmin in Modern Hebrew — is a hexaploid species of wheat (it has 42 chromosomes), like common wheat. 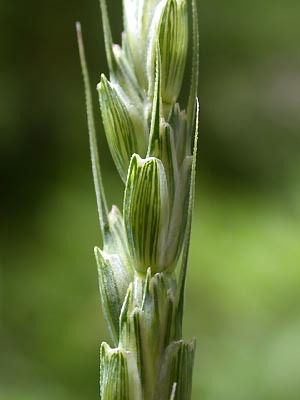 Spelt is a hybrid of emmer (a tetraploid wheat with 28 chromosomes) and a wild goat grass (Aegilops tauschii), possibly occurring north of the Caucasus or in Crimea. 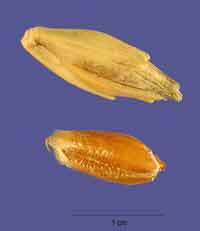 The kernels are slightly longer and more pointed than those of wheat, somewhat resembling barley in appearance. Spelt is a hulled grain (spelze in German and farro in Italian), meaning the husk remains attached to the kernel during threshing and requires much pounding and effort to extract the grain. (Common wheat and durum wheat are free-threshing grains in which the hulls easily slip off.) Spelt is also relatively low yielding. However, spelt grows well in poor soil and without the need for pesticides, since, as with most hulled grains, it naturally resists fungus and insects. It was in Bronze and Iron Age (750-15 BCE) Europe where spelt found its greatest popularity, becoming the predominant wheat species of Germany and Switzerland. The word spelta, believed to be of Saxon origin, was first recorded in 301 CE in an edict of the Roman Emperor Diocletian, the Romans possibly introduced to the grain after expanding the empire northward. Romans, however, preferred common wheat, which they spread through their domains. Ashkenazim mistakenly confused spelt with both the Talmudic shiphon (probably einkorn) and the Biblical kussemet (probably emmer or a generic term for hulled wheat, of which emmer was then the most prominent), as one of the Five Species of grain forbidden on Passover and also requiring the removal of challah. (As a member of the wheat family, spelt is still forbidden on Passover and requires challah removal.) Rashi (Pesachim 35a) translated kusmin into Old French as espelte, which is usually translated as spelt, but may actually mean hulled wheats in general, similar to the German Spelzen and Italian farro. Spelt was not grown in biblical or Talmudic Israel or Egypt and there is no archeological evidence for this grain anywhere in the ancient Near East or Egypt. In the late medieval period, as new species of naked wheat became prevalent in central Europe, spelt consequently lost its attractiveness. Nevertheless, spelt remained the predominant grain in southern Germany until the nineteenth century. Still, it retains a degree of popularity in parts of southern Germany and southwestern Poland. Today, spelt’s primary form is husked and kiln-dried, the resulting grains called gruenkern (literally “green kernels”). Harvesting green grains, such as barley for the biblical Omer offering, is an ancient practice devised to collect a small part of a springtime crop while still immature, thereby salvaging at least that portion, in case a heavy storm would potentially damage or rot the entire yield. Spelt is also used in central Europe to make ale, noodles, pancakes, and bread. Spelt contains a lower amount of omega gliadins (proteins) that engender gluten than common wheat and, therefore, can sometimes be tolerated by those with wheat allergies to common wheat, which has been bred to contain a massive amount of gluten. For some, but not all of those who face problems with common wheat (not those with celiac disease), spelt is fine. Otherwise, the fat and amino acid content of common wheat and spelt are similar. As to my spelt bread, the results were very good. 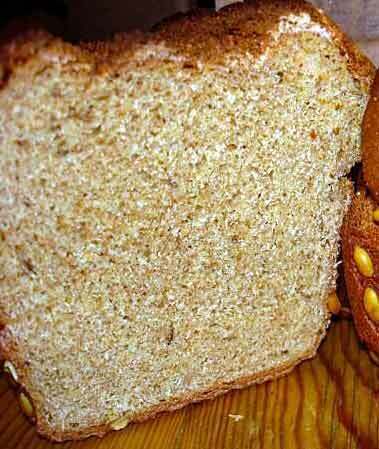 Spelt bread is a bit more crumbly and not quite as high rising as common wheat loaves as well as a light brown hue. But it is still rather fluffy inside, has a crusty exterior, and with a somewhat nutty taste. In many ways, spelt flour can be used similarly to common wheat. However, spelt dough, since its gluten is more fragile and soluble, requires less kneading than common wheat, only 4 to 5 minutes by hand (wheat bread is typically 10 minutes of kneading). Also use less water than in wheat dough (which will weaken the gluten), meaning a firmer dough. However, the dough should not be too dry, or the bread will turn out too dense. I understand that bread machines, which I won’t use anyway, overstress the gluten and produce inferior spelt loaves. To make the dough: Dissolve the yeast in ¼ cup water. Stir in 1 teaspoon honey and let stand until foamy, 5 to 10 minutes. Add the remaining water, oil, salt, and 2 cups flour. Gradually add enough remaining flour until the mixture holds together. On a lightly floured surface, knead the dough until smooth and elastic, 4 to 5 minutes. (Less than wheat flour.) Place in a greased bowl, turning to coat. Cover loosely with plastic wrap or a towel and let rise until doubled in bulk, about 2 hours. Punch down the dough, knead briefly, divide in half, and form into a ball. Place, seam side down, on a parchment paper-lined or greased large baking sheet or in a greased 8-inch round baking pan. Cover loosely with plastic wrap or a damp cloth and let rise until nearly doubled in bulk, about 1 hour. Position a rack in the center of the oven. Preheat the oven to 350 degrees (175 C). With a sharp knife, slit an X in the top. Bake until the bread is golden brown and hollow-sounding when tapped on the bottom, 30 to 40 minutes. Let cool on a rack. Grandma’s makes three flavors, so far: Coconut, Chocolate Chip and Cinnamon. What distinguishes these cookies from the rest of the pack, you ask? Unlike the rest, these are made from kamut. What is kamut? It is one of the oldest used grains, it’s name appears on many Egyptian hieroglyphics. 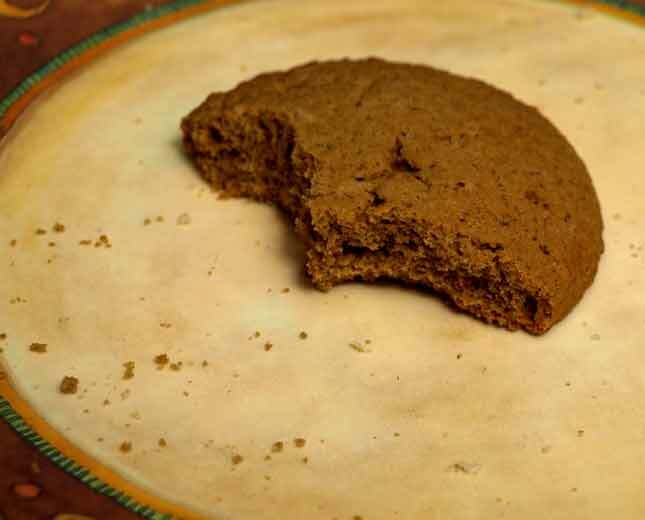 Legend has it, that it was a staple of the ancient Egyptians’ diet, because it was reputed to give high energy to those who ingested it; we can presume therefore that our ancestors while enslaved in the land of the Nile, likely ate it too. Kamut wheat is considered an ancient grain, and because it hasn’t been modified with modern agricultural methods it has many benefits. The grain itself is very high in its protein content. It also contains a high concentration of selenium, zinc, and magnesium. This grain variety is a high energy wheat, and provides the body with more energy in the form of complex carbohydrates. 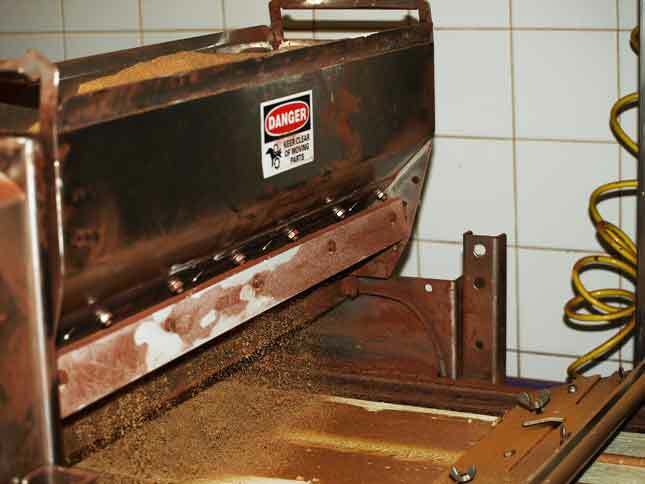 Because of its low oxidation levels it loses little nutritional content when ground and processed. Even though this wheat variety contains gluten, it has been found to be more easily digestible by people who may have slight allergic tendencies. They contain no transfat, no refined sugar and no preservatives. They taste somewhat different from anything I was used to, but the flavors grow on you and you soon come to crave them. My personal favorite was the Chocolate Chip. These cookies are good for you, but… would you expect anything different from a name like Grandma’s?